I have gotten a lot of requests to put these back up, so here is the most updated version of my personal day cycle for Second Life. With this version I'm including my most up to date sky settings, plus the day cycle file for those of you with the most up to date SL viewers with the new day cycle control panel. These are the same windlight settings I used in my screenshots from The Island of Milk&Cream. These are the settings I use all the time in Second Life, unless I'm in a sim that specifically uses alternate windlight settings. Anyone is welcome to use these. 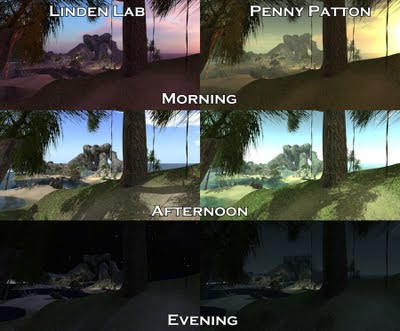 If made the region windlight settings for a sim, or included as presets in an SL viewer I'd appreciate being credited. For those of you who have never installed windlight files before, here is how it's done. Inside the windlight folder you'll find three more folders, "days", "Skies" and "water". In the zip file you download from this blog will be two folders, "days" and "skies". You will want to copy the single file you find in the "days" folder from the zip file into the "days" folder in your windlight directory. Then copy all of the files from the "skies" folder from the zip file to the "skies" folder in your windlight directory. Once that is done, start up Second Life and log in. 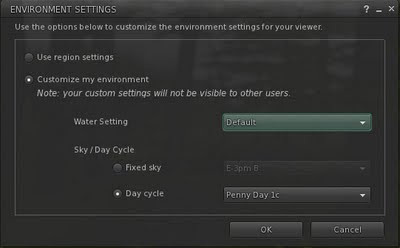 From the Environment Settings panel click on "Customize my environment" and under "Sky/Day Cycle" select "Day cycle" and choose "Penny Day 1c" from the drop down menu. Enjoy your new windlight settings! Thanks, Penny... I installed these the other day and am giving them a try. 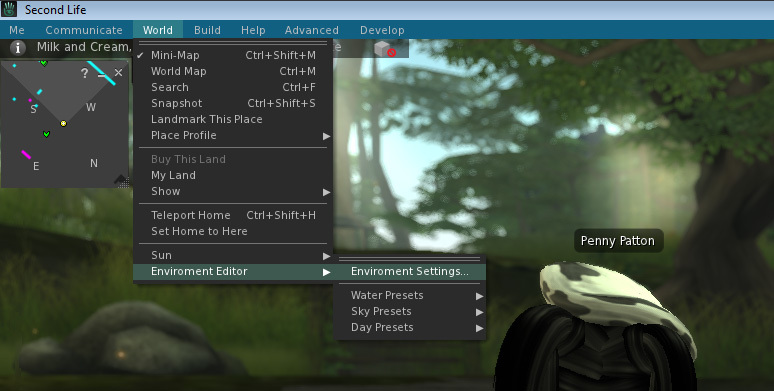 Seeing as UKanDo already has your camera settings as default I’ve now added your Windlight Settings to it as an option! Thanx for all your work on user setting! Let me know if I missed any! Wow! These are beautiful settings. Thank you so much! ROBLOX is driven by an ever growing community of over 300,000 creators who provide an infinite variety of highly immersive experiences. These experiences range from 3D games and contests, to interactive adventures where players can take on new identities discovering what it's like to be a dinosaur, a miner working a mine or an astronaut out in space. I would love to actually use this WL. It looks amazing... but the file doesn't exist anymore. Slightly disappointing. But still looks great! I Want to Look Like A Supermodel!